In the last year you have changed your engagement so many times, it is not good, better to stick to something and complete it than constantly changing. Instead of going to the Rose Garden for the walk this morning, Caitya-guru took Srila Prabhupada to Sukhna (Blissful) Lake. It is actually a large natural catchment enhanced with a man-made shore on one side. It is a good place to walk, with a wide roadway down the side and the Shivalik Mountains clearly visible in the distance. The residences of the governor of Haryana and the governor of Punjab are just nearby. Srila Prabhupada liked the place and strode along quite strongly for the first time in months. 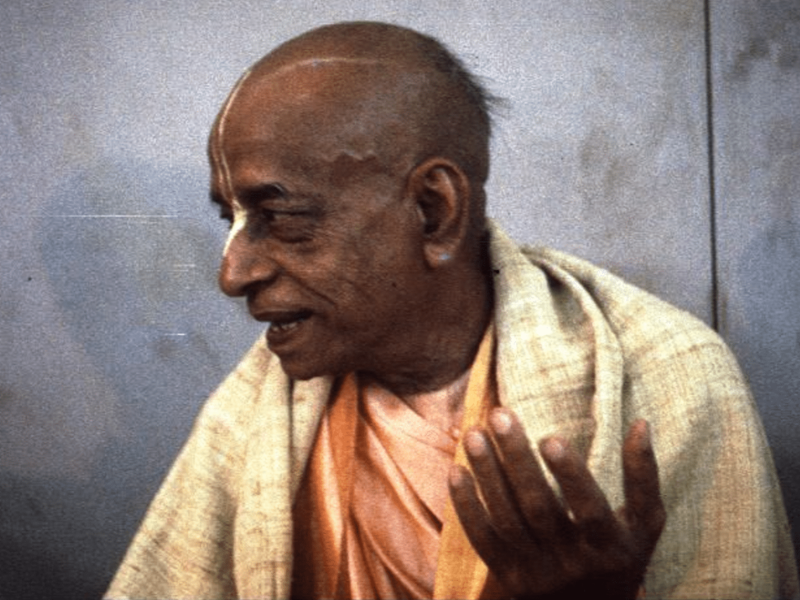 All along the way many important men, including government ministers and High Court judges, came and offered their respects, and as he walked, Prabhupada stopped intermittently to receive their well-wishes, sometimes talking with them quite animatedly. Mr. Mulkh Raj Mahajan, a senior advocate of the Punjab and Haryana High Court, along with a group of advocates, came up to touch Srila Prabhupada's feet and then joined him on his walk. A short time after, we were also joined by Justice Narula and several other bureaucrats. Prabhupada was gratified by their interest and appreciation and he invited them to come visit him in the afternoon at Sethi's house. * * * There being no morning programs, Srila Prabhupada is for the most part spending his days quietly. He is dealing with local management concerns and occasionally meeting with local residents whom Caitya-guru is trying to encourage to help set up the mission here. One such gentleman, Mr. Jairamdas Kuthiala, came to see Srila Prabhupada yesterday afternoon during his general darsana with an offer to help with the Kurukshetra scheme. Kurukshetra lies mid-way between Delhi and Chandigarh, and since Caitya-guru prabhu is also entrusted with procuring land there for a temple, as well as developing Chandigarh, it is natural for him to recruit local men to help with that project. Srila Prabhupada was pleased to meet Mr. Kuthiala and encouraged him to help us. Mr. Kuthiala left a letter behind, which Prabhupada answered today. "Please accept my greetings. I was very glad to see you. I'm sorry that I could not speak to you in detail because other visitors were waiting. I am very much pleased that you are interested in my scheme at Jyotisar, I think that I shall require your help when this plan is in action. If you have time you can come to Vrindaban to discuss some important matters." As is common here in India, where people have great respect and allegiance for a number of spiritual personages regardless of their philosophical persuasion, Mr. Kuthiala expressed some sentiments in his letter for a well-known Mayavadi. In doing so he unwittingly exposed the fellow's behavior to question. Srila Prabhupada picked up on it right away and inquired further about the matter. "So far I know His Holiness Ram Tirtha was a sannyasi, but you have written in your letter that he was a source of love to Japanese girls. I was very much surprised on this point. Kindly let me know what was the point in this connection of Swami Ram Tirtha. It was surprising, as far as I know a sannyasi is completely aloof from womanly connection. I shall be very glad to be enlightened in this connection about Swami Ram Tirtha." Among other letters today was one from sent from Dubai by Jagat Guru Swami, who explained that he and some other devotees from India are there collecting quite successfully for our India projects. Having recently heard about the departure from active duty in ISKCON of Pushta Krishna Swami, the GBC for South Africa, however, Jagat Guru Maharaja expressed his desire to go there to preach. Explaining his own long-standing involvement with the South African yatra and the fact that they now have few men and a debt to the BBT of over forty thousand dollars, he informed Srila Prabhupada of his intent to leave Dubai and requested Srila Prabhupada's blessings for the same. As it happens, Hansaduta Maharaja had given Jagat Guru a loan to enable him to go to Dubai to preach and collect on behalf of the Indian temple projects. He informed Prabhupada of this and expressed his dissatisfaction not only with the fact that Jagat Guru now wants to change his current engagement, but also with his proclivity in general to suddenly drop one thing and do another. Srila Prabhupada agreed with Hansaduta that Jagat Guru Maharaja should try to remain in one service, and he wrote back in that spirit. "I understand from Hansadutta Maharaj that you have gone to Dubai borrowing $400.00 dollars from him. So if you want to change your programme again, at least send this money back to him. "In the last year you have changed your engagement so many times, it is not good, better to stick to something and complete it than constantly changing. If you can carry out your original plan of collecting from Indian in different parts of the world and sending to India that would be good. Why not stick with Nitai Gour TWSKP and make this successful?" * * * As promised, several of the gentlemen whom we encountered on this morning's walk came by for Srila Prabhupada's afternoon darsana. Prabhupada made a strong case for them to take up Krishna consciousness and help revive India's traditional culture. Yad yad acarati sreshthas?they are the intellectuals of society, he reminded them, and whatever example they set will be followed by the masses. They were won over by his humility and strength of conviction. He especially appreciated that they came bearing small offerings of fruits, flowers, sweets, and money. These offerings of dakshina, Prabhupada said, are the traditional way of honoring saintly persons. He was pleased that such traditions were still current here in Chandigarh. In reciprocation, every visitor was given prasadam before leaving. Shri Raj Kumar Gupta, the donor-to-be of land and Deities, also came with his wife for darsana.